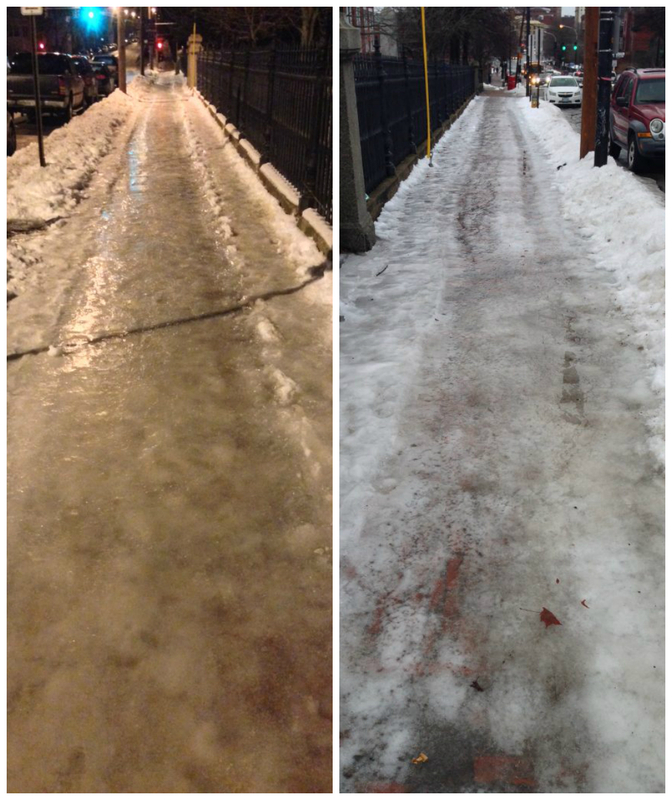 Why are city-owned sidewalks in Portland so icy? Portland can fine you for not clearing your sidewalk. So why are the city-owned ones so icy? Some of the most dangerous sidewalks in Portland this winter have been on city properties such as schools and parks, and city policy has allowed them to stay that way. Walking in Portland can be especially dangerous during the winter, when uncleared sidewalks become coated with ice that can last for days or weeks. Much of the blame falls on property owners, who are required by law to clear the sidewalks around their properties of snow and ice and can be fined by the city if they don’t. But some of the most dangerous sidewalks in Portland this winter have been ones that are owned and maintained by the city itself, such as the ones next to schools and parks. The city has received at least 24 complaints about sidewalks on 13 city properties being covered with ice or snow this winter from citizens through its FixIt website. Dozens more have been posted about sidewalks on major walking routes that the city doesn’t own but has assumed responsibility for maintaining. Some of these sidewalks were covered in ice for weeks during a cold stretch in late December and early January. Not only does the city not face a fine, it also cannot be sued the way a private property owner can if someone slips and falls. City officials say workers are out every day after a storm spreading salt and sand until the sidewalks are cleared. But they also say staff resources are limited and that city policy allows sidewalks, both public and private, to remain covered with ice as long as a product such as salt or sand has been applied. David Wolfe, who lives next to McIntyre Park in the West End, says the city-owned sidewalk in front of the park wasn’t cleared for weeks after it developed a coating of ice in late December, and it only became walkable after a warm spell melted the ice naturally. Another focus of complaints has been the Reiche Community School, which sits on a block of city-owned land in the West End that includes athletic fields, a playground and the Reiche Community Center. The sidewalks around the property have been reported on FixIt as being unwalkable four times this winter so far. The city could not provide information on the number of other complaints received by phone, email or social media. The first complaint, on Dec. 30, includes a user-submitted photo of a sidewalk buried under snow the morning after a storm. The city posted an automated message on Jan. 3 saying the request had been closed, without any explanation. Meanwhile, the property was reported again on Jan. 3. 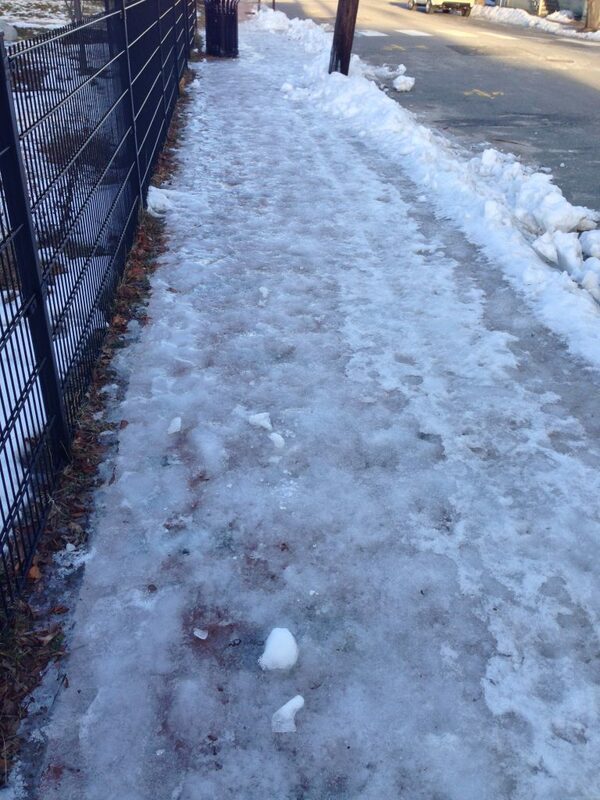 “The sidewalk that goes by the basketball court on Brackett is a solid sheet of ice, impassable. People are walking in the street to avoid it,” the complaint says. On Jan. 5, yet another complaint was posted with a photo of the Brackett Street sidewalk in front of the school completely buried under a layer of bumpy ice. “This is especially dangerous because many of Reiche students, ages 5-10, walk to school,” wrote a commenter identified as Jeanne Swanton. Other city-owned properties that have racked up multiple complaints about icy sidewalks include Eastern Cemetery, Longfellow Elementary School and McIntyre Park. If the city were a business or homeowner, it could face serious consequences for leaving its sidewalks in such poor shape. A business that doesn’t clear snow and ice from the sidewalks around its property within 12 hours of the end of a snowfall can get a $250 fine. Homeowners have 24 hours to clear their sidewalks, and fines range from $50 to $200, depending on the number of violations. The city says it issued over 400 violations for snow and ice on sidewalks this winter, as of mid-January. 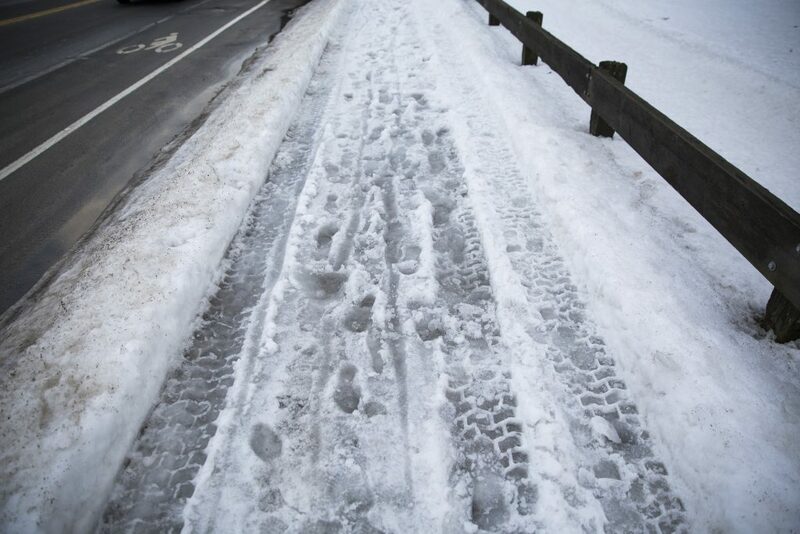 Any private property owner also can be sued for damages if a pedestrian is injured on their slippery sidewalk. In cases of severe injury, that can put the property owner on the hook for tens of thousands of dollars. But if the sidewalk is on city property, no matter how icy it is or how badly the pedestrian is hurt, the city is not liable for slip-and-fall injuries. Under state law, municipalities are immune from liability relating to snow or ice on sidewalks. Many people who are injured in falls on city-owned sidewalks are stunned to find out they can’t sue the city for medical expenses, says Sheldon Tepler, a partner at the law firm Hardy Wolf & Downing. The legal concept of sovereign immunity means governments are generally protected from claims or suits for which private entities would be liable. There are specific exemptions to that immunity, such as a local government’s negligence in maintaining its buildings, but icy sidewalks are not covered under any of those exemptions. The city says it plows more than 120 miles of sidewalks. “It would be very difficult for the city to make sure every inch of their public pathways is safe,” Tepler said. And since there is no risk for the city, there’s not as much incentive to keep its sidewalks clear, Tepler said. “We are very careful about clearing the area around our office because we know we can get sued. The city is immune, so they don’t,” he said. That discrepancy was on display on Jan. 4, when the sidewalks on Congress Street from India Street to the top of Munjoy Hill were in unusually good shape. Every property owner on the south side of Congress Street had cleared their sidewalks down to the bricks – except the city of Portland. The sidewalk along the Eastern Cemetery, which the city owns, was an impassable sheet of solid ice. And, like the Reiche School, this stretch of sidewalk had not been cleared of ice for weeks despite three FixIt complaints since Dec. 21, all containing photos that show the sidewalk coated in ice. 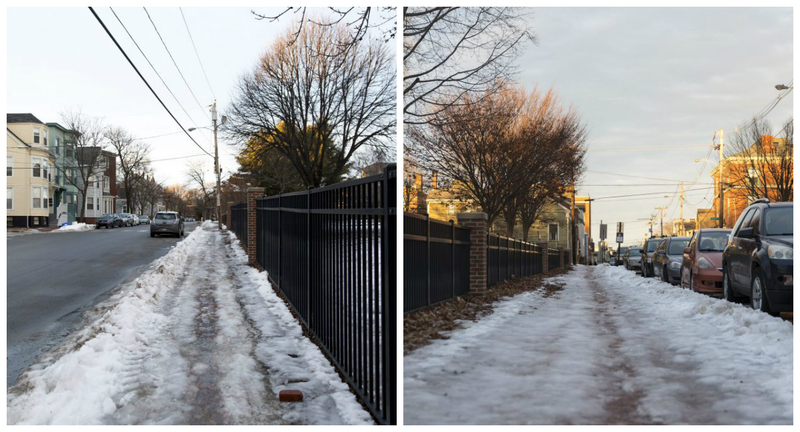 An impassable glaze of ice covers the Eastern Cemetery sidewalk on Congress Street on Jan. 3 (left) and Jan. 4 (right). The next day, the situation was the same at Marada Adams Park on Munjoy Hill. The Wilson Street sidewalk next to the park showed signs of the city’s signature sidewalk clearing method: the tracks of a sidewalk plow that had cleared some of the snow from the sidewalk, but did not go all the way to the bricks, leaving a coating of snow that had melted and then frozen into slick ice. An elderly woman trying to walk her dog was forced to walk in the street, which was clear and dry. 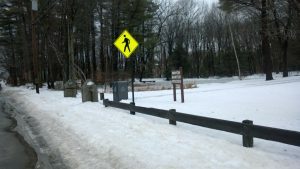 The sidewalk next to Marada Adams Park on Munjoy Hill is an icy mess on Jan. 5. And that’s not even counting the sidewalks on major walking routes like Congress Street, State Street and Park Avenue, which the city has assumed responsibility for clearing, even though they mostly go past private properties. Dozens of complaints about the conditions of those sidewalks have been posted to FixIt too, and many were closed without any visible explanation. City spokeswoman Jessica Grondin said that means it’s acceptable for a sidewalk to be covered in ice as long as sand or salt has been applied. The city has five sidewalk plows and 10 workers in various departments clearing sidewalks in shifts, according to Grondin. Hipple says the city addresses its icy sidewalks by continuously spreading sand and salt on the ice until it’s gone, which can take a long time. Snow is piled high on the Forest Avenue sidewalk next to Baxter Woods on Jan. 4. But Wolfe, the homeowner who lives near a city-owned sidewalk on the West End, says that hasn’t been happening. Wolfe posted the first of four complaints this winter about the sidewalk on Taylor Street in front of McIntyre Park. He’s lived on Taylor Street for about 17 years and says this stretch of sidewalk has been a problem every winter. It was particularly bad in late December and early January. But the city’s only response to Wolfe’s complaint was to say that “the location was reported to be in compliance.” It got three more citizen complaints after that. Wolfe said he never saw any evidence of action by the city over a period of several weeks. It remained covered with ice until warmer weather in January took care of it naturally. “Nobody had come along and put anything on that ice,” he said. Wolfe was surprised to hear the city’s response to the Press Herald’s questions – that it has workers out every day applying salt and sand to icy sidewalks. Wolfe said the condition of the city’s sidewalk is particularly frustrating given his own liability for the sidewalk in front of his home.